Dhaka, Jan 5 (Just News): Bangladesh Nationalist Party chairperson Begum Khaleda Zia on Friday claimed that it is bullet, not ballot, the source of power of the prime minister, Sheikh Hasina. Khaleda Zia tweeted the remark while observing 4th anniversary of ‘one-sided’ general election of January 5, 2014 boycotted by most of the political parties including BNP-led alliance, demanding the election to be held under a non-party neutral government. The two rival parties-Awami League and BNP-observe January 5 with opposite stances, with BNP observing ‘democracy killing day’ while ruling AL marking it as ‘victory day for democracy’. 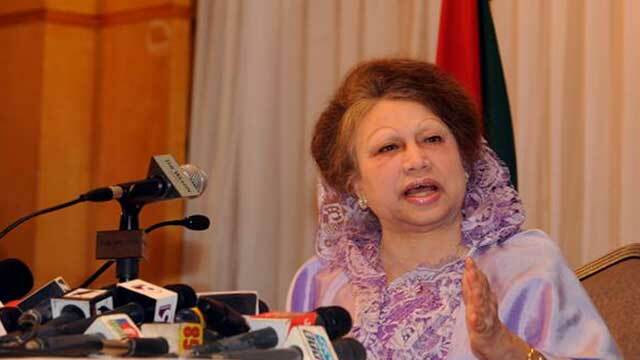 ‘Not ballot but bullet is the source of Hasina's power,’ Khaleda Zia said in a message posted on her twitter account. ‘Jan 5's disgraceful voterless poll is a cruel joke at our historic struggle for voting rights and back-stabbing our democratic progress.